Today, in this vibrant city Bangalore we with Kunal Bysani, a food content writer we explore some of the famous, mouth-watering dishes. We first headed to Mudanna hotel and tried their famous mudanna pulao served in a cone made out of banana leaves. It is undoubtedly Bangalore’s favourite pulao and they like to call it as palav. It is truly flavourful and mild in its texture and taste. Also, their triangle idli is out of this world. These are special soft idlis in the shape of triangle served with spicy sagu. Our next destination was SGS non veg- gundu palav. We try their chicken palav, a dish which has rice and chicken cooked separately but, best tastes with black pepper and salt. We then move to KR market also known as Krishna Rajendra market is a retail market. The market was constructed by the king of mysuru himself. It has one of Asia’s larget flower market and also incorporates, the butti market. Butti is basket in kannada and the vegatbles here are sold in an old school style per basket. We head to, Rangana military hotel and begin with kaal soup, a leg soup which is really healthy to drink and then moved on to having dose- keema gojju, a dish which consists of dosa and mutton keema having a slight turmeric flavour to it. Next, we go to shivaji military hotel. We began with chicken dry, a chicken marinated really nicely with yoghurt and spicy black pepper and then tried their amazing Donne biryani which originated here. Last but not the least, we went to the Shree idly corner and tried their soft idlis with coconut and red chilli chutney served with homemade butter. Not to forget, we tried their savage bhaat too. This is rice made into noodles incorporated with spicy tadka and served in a classic settee style or shavige called shastralu among Bangalore settys. We first headed to Mudanna hotel and tried their famous mudanna pulao served in a cone made out of banana leaves. It is undoubtedly Bangalore’s favorite pulao and they like to call it as palav. It is truly flavourful and mild in its texture and taste. Also, their triangle idli is out of this world. These are special soft idlis in the shape of triangle served with spicy sagu. Our next destination was SGS non veg- gundu palav. We try their chicken palav, a dish which has rice and chicken cooked separately but, best tastes with black pepper and salt. We then move to KR market also known as Krishna Rajendra market is a retail market. The market was constructed by the king of mysuru himself. It has one of Asia’s largest flower market and also incorporates the butti market. Butti is a basket in Kannada and the vegetables here are sold in an old school style per basket. We head to, Rangana military hotel and begin with kaal soup, a leg soup which is really healthy to drink and then moved on to having dose- keema gojju, a dish which consists of dosa and mutton keema having a slight turmeric flavor to it. Next, we go to shiva military hotel. We began with chicken dry, a chicken marinated really nicely with yogurt and spicy black pepper and then tried their amazing Donne biryani which originated here. Last but not least, we went to the Shree idly corner and tried their soft idlis with coconut and red chili chutney served with homemade butter. Not to forget, we tried their savage bhaat too. This is rice made into noodles incorporated with spicy tadka and served in a classic settee style or shavige called shastralu among Bangalore settys. 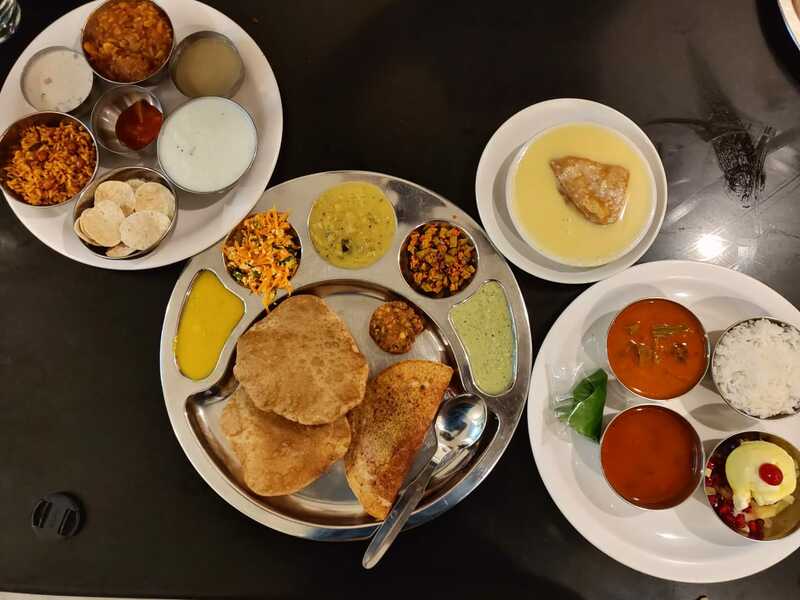 Today, with Anamika, a part-time food blogger we explore breakfast options in one of the urban cities of India, Bangalore or as people like to call it with love, Bengaluru. We begin with Maleshwaram, apparently claimed to be one of the best places in Bangalore and has quite a few iconic legendary places to have breakfast. We begin with Veena stores which serve mouth melting idlis. The best part of this place is that the food is served in very eco-friendly measures! We tried their idli, vada, and Bisi bele bhaat. The vadas and idlis are served in an ocean of coconut and gram chutney! The bisi bele bhaat is all about chopped vegetables boiled with bele or dal in Kannada. Next on our list was Sri Raghavendra stores. We tried their Shavige bhaat, these are rice noodles in typical old Bangalore style. Also, their Kesari bhaat is a must try. It is made up of semolina or sooji and has a sweet hint of saffron or kesar to it. Next was New Krishna Bhavan and here we try the unusual but, sure to soothe our food palette! We had their green idlis. These are mini-idlis known as button or bullet idli mixed with tadka, spinach, and Indian spices. Then, we went to Central tiffin room, another legendary place which was established in 1930. Certainly a place you can’t miss when in Bangalore! Here we tried their Benne masala dosa. An amazing thick and crispy dosa which has beaten rice added to it with huge dollops of butter served with groundnut and coconut chutney. We ended our meal with a strong cup of filter coffee. It is a must try when in Karnataka. Our next destination was Janatha hotel. We tried their Uddine vade, also known as medu vada served with their quintessential coconut chutney. It is made up of urad dal and the hotel is especially known for the crispy vadas it serves. We headed towards Hassan Veg restaurant and tried their benne kali dosa served with loads of butter! Next, we covered the Chikkanna tiffin room. We tried their kali dosa and bhaat masala dosa. Bhaat masala dosa is all about the lethal combination of rice/bhaat topped on dosa with lots of ghee. While Kali dosa was served with sagu and soaked in ghee. Our breakfast trail ended with Holige mane. We tried their, holige. Dal holige is possibly one of the best desserts in Karnataka and is surely a must try! They served with a wide variety of holiges. One of them was the badam holige consisting of filling of almonds. Along with Dr. Hema, an avid food blogger we go through the beautiful streets of Bangalore as we explore their cuisine and culture. We first head to Siddappa hotel which is attached to a temple. We try the idli chutney sagu, a dish which consists of soft fluffy idlis served with vegetable sagu, ghee and coconut chutney and Chitrana also known as lemon rice. The hotel is known for the authenticity of the food it serves, especially Chitrana. In times, when there’s a huge influx of crowd in to the place the famous siddappa dosa evolves into a half masala dosa which is equally loved by people across the city. Next we move on to one of Bangalore’s famous breakfast places, Vidyarthi Bhavan. We begin with chow chow bhaath, a sweet savory consisting of khara bhaath and kesari bhaath. It is served with coconut chutney and vegetable sagu. We also try the crisp masala dosa which has been a part of the legacy for 75 years. The recipe hasn’t hanged till date and is a favourite amongst the localities’. Our next stop is, Brahmin’s coffee bar where we try the cult favourite idli vada served with crispy vadas and coconut chutney and their strong filter coffee. They serve Bengaluru’s best filter coffee. Thus, it’s a must go! We then head to Puliyogare point and try their Puliyogare, a dish which consists of rice infused with tamarind chutney or gojju and served with sweet Pongal or as we like to call it, the humble khichdi. Next we visit Meghna foods where we try the Meghna special 555, a dish which is flavoursome and spicy, filled with cashew taste and prominent pepper flavour. The speciality of this place is the Meghna special chicken biryani. We head towards, MTR (Mavalli tiffin room) where we are served with a main thali which consists of coconut and pudina chutney. This unique chutney has been originated here with the base as coconut and pudina adding the extra flavour to it. The next in the thali was beans palya, these are shallow fried beans with tadka and served with grated coconut and vegetable sagu, the sagu is a dish that has vegetables cut in small pieces and coconut which is served as a curry. The thali also has, kosambari, a dish made up of urad dal with fresh cucumber and green chillis. We also have the masala vada made up of two types of dal, crunchy puri and masala dosa. Last but not the least, the thali ends with a desert called as rava payasam. We also tried the bisi bele bhaath which consists of chopped vegetables boiled with bele or dal in Kannada. This is served with Mussur bhajji, a south Indian version of the north Indian raita. All of this is topped with fruit salad served with ice cream. Our sweet tooth isn’t put to rest as we also try Chandrahara! A special desert only available in MTR, nowhere else. We head to Hari super sandwich, one of the most college hubs well known for its sandwiches. We try the chocolate sandwich, a favourite among college students with loads of oozing chocolate from the sandwich! The next is their Hari special sandwich with mushroom, grated cheese and mayonnaise filling inside. The most selling item is the American sweet corn sandwich served with sweet corn cheese and their patent chutney. Lastly, we head to Maiyas for a cup of frothy freshly brewed coffee. Mangalore as a city and Mangalorean cuisine has grown up to accommodate various cultures and ethnicity ranging from Muslims, Mangalorean Catholics and Saraswat Brahmins to name a few. Being a coastal city, it is easy to recognize that the staple diet here happens to be fish. Moreover, almost like all coastal cuisines it is spicy and rice based. With, Karishma we explored the Hotel Maharaja which is situated on bunts hostel road in Mangalore, Karnataka. The restaurant is well- known for its ghee roast! We tasted some flavoursome Mangalorean delicacies To begin with, we tried shell fish (marvai) sukka. Sukka means dry in their local language and it is a sea fish prepared in Mangalorean style. This was followed by Neer dosa or what is also known as water dosa along with chicken curry. Neer dosa is prepared using the same usual batter that is used to prepare the basic dosas, except that a lot of water is added to the batter. Hence, the dosas are much thinner in their texture. With different dishes being brought to us we also tried the chicken ghee roast. It is a spicy dish cooked heavily in ghee with red chilli paste. Later, we tried the kori roti. An absolute favourite of the Mangalorean’s, these are crisp dry wafers made from boiled brown rice served alongside chicken curry. Kori means chicken in tulu. Kori rotis are also, readily available at grocery stores so if you want to take them back to your home, it won’t be much of a task! One ingredient that is taken into account while preparing almost major Mangalorean dishes is curry leaves. They are heavily used in almost all preparations. Next, we head to one of Mangalore’s the most popular go-to spots is Giri Manja’s. This little eatery is tucked away in the car street. Highly recommended by the locals, it is a must try out here! Well-known for their sea-food we try their fish thali which consists of boiled rice served with kokam saar, fish curry and veg curry. The thali is served with bonda juice also known as tender coconut juice. Along with this, we tried the prawn fry locally known as yetti fry and squid fry which is known as bondas fry. We were then served with, anjal fry. A seer fish fried in Manjas style. This, happens to be their special dish, which is certainly a must-try! The flavours are tangy and the fish is marinated for the longest time thus, bound to capture your taste pallets. At hotel Karthik, we try the Mangalore snacks. Here we ordered the very-famous Kalladka tea also known as KT, a three layer tea with the bottom layer consisting of condensed milk, foam and then served with decoction. This was served with banana podi locally known as parndh podi. These are banana fritters. The bananas used to cook these are known as Etha pazham banana. Then comes the Mangalore buns, sweet, soft and fluffy puris from Udupi, a well-known region in Mangalore. Not to forget, the goli bajje, a famous evening snack. These are soft and spongy fritters made with all-purpose flour, spices and herbs. We were later introduced to, a local mobile shop known as Halli Mane rotties situated in Gandhinagar. The food joint offers three types of rotis made up of ragi, jowar and rice. These are really good for health and gluten-free! The rotis are served with a mixed vegetable curry and punarpalli juice also called as Kokam juice. The juice is sweet and good for digestion. Right opposite to Kaddri park, is a lane which has quaint little food joints for everyone to try. We head to Dinky dine where we tried the grape juice. It is juice joint really famous in Mangalore. The day came to an end on a sweet note as we headed towards the ice-cream parlour. Here we tried the Marzi pan ice-cream, a sweet pan-flavoured ice-cream and gudbud, a multi-layer ice-cream consisting of three flavours, butterscotch, strawberry and vanilla served with cherries and fruits. Namaskara! Today we are headed to the cultural capital of Karnataka which is Mysore. Mysore, officially known as Mysuru is the second largest city in the state of Karnataka. According to hindu mythology, Mysore was ruled by the demon Mahishasura, known as a buffalo-headed monster. It is apparently said, that the demon used to terrorise the local population and in response to their prayers to save them from the demon, goddess Parvati took birth as chamundeshwari and killed the demon on the top of the Chamundi hill. Thus, the city got its name as Mysore. Our food journey started with Keerthana accompanying us. Along with Keerthana, we headed to the famous Mylary Agrahara and tried their Mylari dosa. It is really soft in its texture served with coconut chutney and onion sagu. The softness of the dosa filled us to the brim and we then headed towards Amruth Veg. Here we tried a combination of three different dosas also known as the Amruth special dosa. These were Ragi masala dosa, pudi masala dosa and plain dosa served with vegetable sagu, chutney and loads of butter! The meal was followed by a yummy frothy and strong filter coffee. Keerthana, later introduced us to Mallige idli, these are soft, spongy aromatic idlis got its name due its texture and resemblance to jasmine flowers. Our next destination was Hanumanthu hotel, a pretty old establishment. Well, 1932! You can imagine how old it must be! We came here to try their famous mutton pulao which is cooked from bullet rice and mutton fat. Further, to try the rural food of Karnataka, we went to Uncle Loobo’s- Sugi mane. We had an amazing experience learning how to cook Ragi Mudde. Moreover, you get to have a totally authentic experience as the food is served on banana leaves. We had the amazing keema sambhar which was served with minced meatballs and had to be consumed with little bites of Raggi Mudde. Having Raggi Mudde, only makes us realize how we are slowly coming back to our roots as we try to cure various lifestyle diseases, like diabetes. Ragi or finger millet is a staple rural food of Karnataka which is consumed frequently. To try some classic home-based Karnataka dishes we visited, Anima Madhva Bhavan. Here we tried their, well-known heritage platter which is served without any onion and garlic. The platter consists of paddu, these are steamed rice balls and they are deep-fried served with coconut chutney. The next item is, nucchinunde these are dumplings made up of lentils. This was followed by gojjuvalakki, a popular breakfast dish prepared using beaten rice with rasam powder and tamarind. The meal ended with ghodi payasa, which is cooked broken wheat kheer. We then headed towards, Guru Sweet mart for Karnataka’s one of the most loved sweets Mysore Pak, which is made up of gram flour, ghee, cardamom, turmeric and sugar. This was originally invented in the royal kitchen of Mysore by Kakasura madappa. The sweet dish later went on to win the hearts of many! A great day spent exploring food and traditions ranging from the best Malhari dosa to the creamiest Mysore pak which simply melts in your mouth! Go try and we’d love to know your experiences with the city of culture, Mysore.